MOUNTAIN VIEW, CA--(Marketwired - Oct 2, 2015) - Peel, maker of the world's leading smart remote app, Friday announced its predictions for winners and losers from among this year's crop of new shows based on tune-out data from its 12 million monthly active US users. In 2014, Peel was able to predict with 92 percent accuracy which fall premieres would land on the chopping block and which would survive for another season based on whether the shows held the attention of more than 70 percent of viewers for at least 15 minutes of the first episode. Leading the crop of predicted 2015 successes is CBS' detective drama "Limitless" with 73.8 percent of viewers remaining tuned in for at least 15 minutes of the premiere, followed by two more crime dramas: Fox's "Rosewood" with 73.3 percent and "Blindspot" with 72.5 percent. ABC's "The Muppets" (72.2 percent) and Fox's "Grandfathered" (70.2 percent) also appear destined for success. Topping the list of new shows headed for quick cancellation were ABC's "Blood & Oil," which had only 60 percent of viewers still tuned in after 15 minutes, followed by Fox's "Minority Report" (62.9 percent), CBS' "Life in Pieces" (63.3 percent) and NBC's "The Player" (65 percent). The star-studded family comedy "Life in Pieces" suffered in part from very stiff competition in its time slot. Peel, which also tracks where viewers go when they defect from a show, found that 21.2 percent of "Life in Pieces" viewers jumped to NBC's "The Voice," 7.9 percent to ABC's "Dancing with the Stars" and 6.1 percent each to Fox's "Gotham" and CW's "Penn & Teller: Fool Us." Likewise, NBC's Wesley Snipes action series "The Player" suffered from airing opposite Shonda Rhimes' "How to Get Away with Murder" on ABC, which grabbed 14.3 percent of channel switchers and "Thursday Night Football" on CBS, which stole another 10.7 percent. 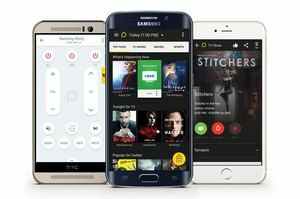 "Tune-out data, along with other engagement metrics such as reminders set for next week's episode, appear to be a much better indicator of success than the total number of viewers who tune in to a premiere," said Peel CEO and cofounder, Thiru Arunachalam, whose remote control app now has 125 million registered users globally. "Viewer retention and 'likes' signal the quality of a premiere episode rather than how much money was spent promoting it or what hit show led into it." "'Life in Pieces,' for example, was scored a winner based on Nielsen data showing 11.28 million viewers and a 2.6 rating in the 18-to-49 demographic, as it benefitted from the strong audience lead in from 'Big Bang Theory.' But the high rate of viewers tuning out and low level of reminders to watch told a very different story," added Arunachalam. One show that missed the 70 percent tuned-in cut-off, the Ryan Murphy horror comedy "Scream Queens" (66.5 percent), may have a chance of survival based on the other success factors tracked by Peel. 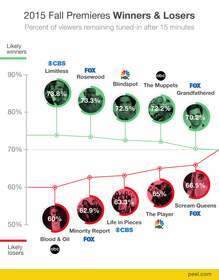 It ranked second highest (17.7 percent) behind "Blindspot" (18.1 percent) in the ratio of viewers choosing the show as a favorite or setting reminders to watch the following week's episode, indicating it may have found a loyal niche audience. Overall, the 20 comedy and drama 2015 TV premieres that were analyzed averaged 67 percent of viewers remaining tuned in after 15 minutes, about the same as 2014's average of 68 percent. For more complete fall premiere viewer data visit Peel's blog. The Peel Smart Remote app, which turns Android or iOS smartphones and tablets into smart universal remotes, is used by 125 million people globally to control their TVs, set-top boxes and other home appliances. Viewers can also set calendar reminders, program their DVR and "favorite" a show, giving Peel access to unique data about TV preferences and viewing behavior. By examining its data, which is only held in aggregate and not personally identifiable, Peel is able to provide personalized content recommendations and target tune-in and brand advertising to video entertainment consumers. Peel was founded to redefine the home control experience by seamlessly connecting users via their mobile devices and social media with personalized TV, cable and streamed content recommendations. With more than 125 million registered users who have generated 135 billion remote commands, Peel is the recognized leader in intuitive program discovery, TV program interaction, and intelligent home room control. For more information, visit www.Peel.com.